We all have to work to cultivate joy. But when you're in a funk, it can be hard to "snap out of it." This bundle will help you do just that! 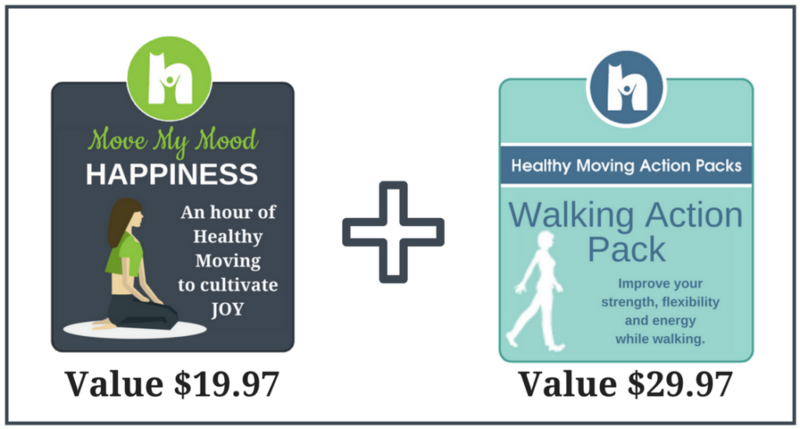 What's included in the Move My Mood: Happiness Class? ​Move your body in new ways. Move your mood to a more joyful, happy state. Foster a spirit of playfulness, gratitude and fun. Strengthen your legs, hips, pelvic floor and core. And...as tons of research also shows the mood-enhancing benefits of walking, this bundle will also help make every step you take more powerful! What's included in the ﻿Walking﻿ Action Pack? Lateral Hip Video Lessons: Did you know that you can strengthen the sides of your hips while walking. This will show you how to wake up those muscles and get them to fire as you walk. Hip and Glute Video Lesson: Maybe you've heard that a healthy gait cycle involves a posterior push-off. This lesson will lay the groundwork for strengthening your glutes as you walk. Hip Flexor Video Lesson: If you spend a lot of time sitting in a chair, your hip flexors are probably holding a lot of tension...even as you stand and walk. Release that tension with this lesson. Arm Strengthening Video Lesson: This lesson show you how to tone your arms with every step you take! Eye Release Video Lesson: Learn how to release all the tension in your eye muscles on your walk with this lesson. PDF Printable: Post this one-page printable of all of the exercises somewhere you will see it often, so you can remember to weave more Healthy Moving into your day! Access to a private Facebook community: Here you will be able to get group support and encouragement. Choose a username and password and click Buy Now to get started! There are enough risks in life. This course shouldn't be one of them. If you decide it isn't for you, no problem! Just email billing@healthymoving.com within 14-days of registering, for a full refund. Absolutely! If you have purchased other Healthy Moving courses and programs, you can use the same login credentials. Simply enter your Healthy Moving username and password when registering, so you can access all of your content under one username. You will need a high-speed internet connection to stream the videos. A Facebook account will also allow you the most interaction with the program, but is not required. This is a digital product. And all of the class videos are available for streaming. You will be able to access them with the username and password you set up with your purchase. Additionally, you can download any PDFs that come with your bundle. Do I have to have a PayPal account to join the program? Nope! Simply select the link that says “No PayPal account? 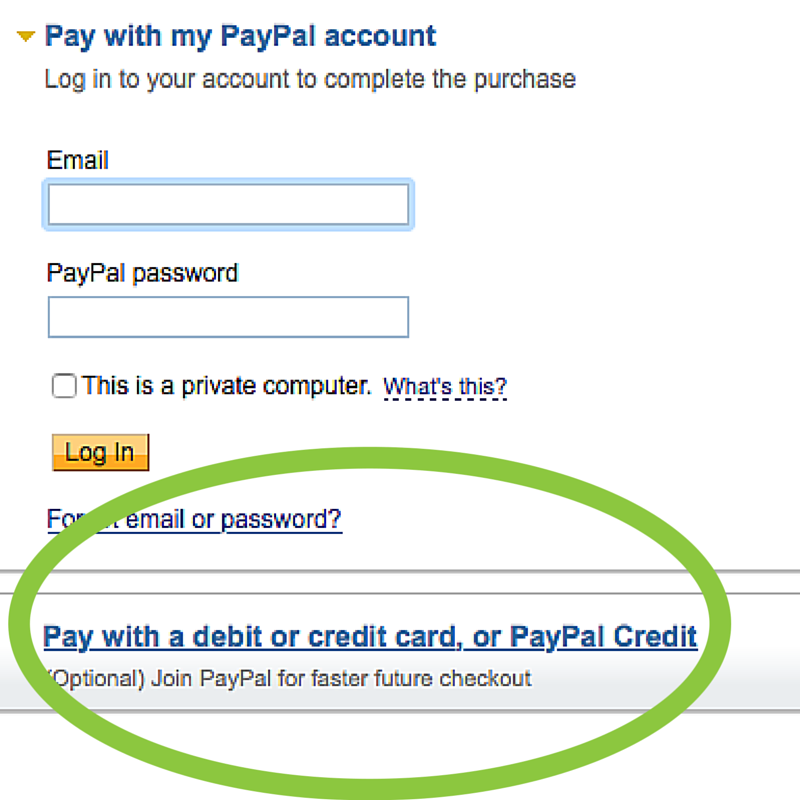 Pay using your credit or debit card” under the PayPal login section.